This entry was posted in Blog on February 23, 2018 by extramileadmin. https://www.clarionledger.com/videos/news/2017/05/29/heroin-addiction-deaths-surge-mississippi/102297470/ For the first time in U.S. history, heroin overdose deaths outnumber those of gun homicides. Mississippi drug overdose deaths have reached a record high — boosted in part by heroin, sometimes laced with the even more dangerous fentanyl. “Mississippi is emerging on the brink of a super pandemic,” said state Bureau of Narcotics Director John Dowdy. In 2016, Mississippi saw at least 211 deaths from drug overdoses — the highest in state history. Dowdy derived that number from death certificates. He suspects the real number is much higher as evidenced by drug tests, which would increase the deaths to 220 (with oxycodone detected in 45 deaths and fentanyl detected in 33 deaths). But not every coroner uses the state Crime Lab, Dowdy said. The state Department of Health puts the number of drug poisoning deaths, excluding homicides and suicides, at 274. Marshall Fisher said heroin had almost vanished from the landscape when he moved in 2003 to Mississippi to head the Drug Enforcement Administration office. Fisher said the only heroin cases he saw then were when authorities busted cars heading for other places, such as Chicago and Atlanta. In 2011, he began to witness a wave of overdoses involving opioids — a family of the often addictive painkillers derived from the morphine molecule, including morphine, fentanyl, oxycodone, hydrocodone and their illicit cousin, heroin. 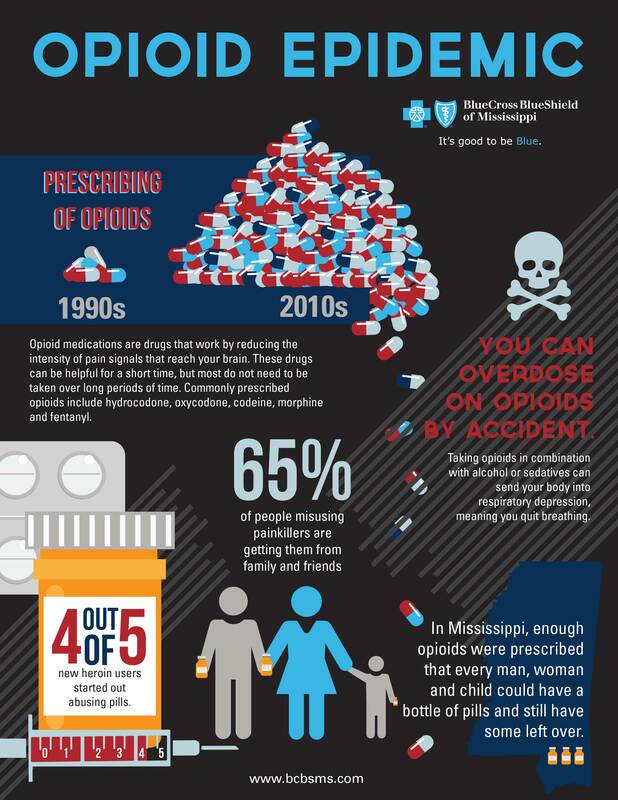 Mississippi is one of a handful of states where there are more opioid prescriptions than there are people. In fact, the state prescribes so many opioid painkillers that each man, woman and child could swallow a pill a day for 67 days without running out. More Americans die each year of drug overdoses than died during the entire Vietnam War. “It’s like two jumbo jets going down every week,” said Fisher, who now heads the state Department of Public Safety. “Would we accept that from the airline industry?” To help stop what he calls a “scourge,” Gov. Phil Bryant has formed the Opioid and Heroin Study Task Force. Congress has approved $3.58 million to the state Department of Mental Health to aid in that fight. Dowdy said many of those addicted to opioids are switching to heroin as a cheaper alternative, pointing out that seizures testing positive for heroin at the state Crime Lab were 67 in 2012 and are expected to top 400 this year, if the current trend continues. “A prescription opioid costs $65 to $85 a pill on the street,” he said, “but a package of heroin may run only $10.” One of the governor’s task force members, family practice physician Dr. Randy Easterling of Vicksburg, said he hardly saw a heroin addict years ago. Now he sees two or three a day. But he believes there is an even more dangerous threat these days than heroin and that is fentanyl, which is 50 times stronger than the illicit drug. The prescription drug, sold in timed-release skin patches, is available only to cancer patients suffering from breakthrough pain. Addicts abuse the patches by melting them, he said. “It’s a long-lasting opioid, so the effect on the body is erratic.” Mexican cartels are now lacing heroin with fentanyl, in part because the painkiller is cheaper to produce than heroin, he said. “The fentanyl is being made in China. You don’t know what you’re getting,” he said. “Then it’s being mixed with heroin that you don’t know where it’s from. People are dying.” The Centers for Disease Control and Prevention reports that deaths from fentanyl have increased 75 percent over the past year. One of them was the music legend Prince. d 75 percent over the past year. One of them was the music legend Prince. In Mississippi, Dowdy is working to keep heroin and fentanyl off the streets. “The $50 million question is, what are we going to do when we’re like an Ohio?” he asked. Ohio leads the nation with thousands of opioid overdose deaths a year. One coroner’s office became so backed up with corpses it had to call up a local funeral home to hold the extra bodies. In Mississippi, the number of people treated for heroin addiction has more than tripled over the past three years, going from 99 to 306, according to the state Department of Mental Health. “We are mirroring the national trend,” Dowdy said. In four years, heroin-related overdose deaths in Mississippi have skyrocketed from one in 2011 to 35 in 2015. To combat overdoses, Mississippi lawmakers approved a bill that provided legal immunity to first responders who administer naloxone or similar drugs to reverse an overdose’s effects. But the bill included no funding to provide responders with the drug, which retails for about $125 for two doses.